They may well be contenders for the title of Canada's hardest working party band. 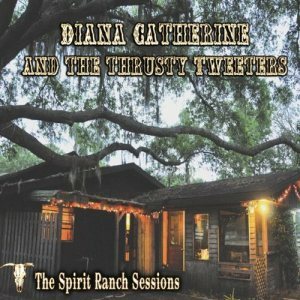 True road dogs they are, Diana Catherine and the three burly men who comprise the Thrusty Tweeters, as they tour their infectious bluesy rock up and down the map non-stop. When I saw the band perform at the old Ironwood Bar & Stage about a year and a half ago, I was a little awestruck by just how charismatic a performer Diana Catherine is. With a huge stage presence that is part swagger, part vulnerable clown, she is pretty mesmerizing. Lately I've been revisiting the CD that I brought home from that show - The Spirit Ranch Sessions - and it transports me right back to that night at the Ironwood. This album manages to capture much of the exuberance of the Thrusty Tweeters' stage experience. From the opening wail of Diana's harmonica on Walk, through to the crying muddy guitars and heartfelt yearning of the closing notes of Drifting, The Spirit Ranch Sessions is the journal of a traveling band. It's also a journal of drinking and fighting and getting your love on the run. Sober (Is Too Hard To Stay) is an unapologetically boisterous track that hooks you with handclaps and a call and response chorus, while Train Song hypnotizes with lazily seductive blues. These are tales of restlessness and the road, hard living and the sweet regrets of tender loving. This is Southern rock served up Northern style. And it's tasty. ...and, they have an excellent name. They do indeed, Mr Anchovy. Most memorable. You had me at handclaps. Well there is not an excess of handclaps in the album, but the harmonica more than makes up for that, Al.